Methods of Foundation Engineering covers the theory, analysis, and practice of foundation engineering, as well as its soil mechanics and structural design aspects and principles. The book is divided into five parts encompassing 21 chapters. Part A is of an introductory character and presents a brief review of the various types of foundation structures used in civil engineering and their historical development. Part B provides the theoretical fundamentals of soil and rock mechanics, which are of importance for foundation design. Part C deals with the design of the footing area of spread footings and discusses the shallow foundation methods. 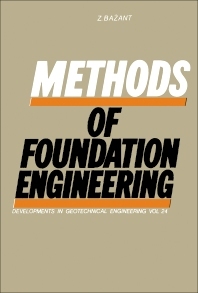 Part D describes the methods of deep foundations, while Part E is devoted to special foundation methods. Each chapter in Parts C to E starts with an introduction containing a synopsis of the matter being discussed and giving suggestions as to the choice of a suitable method of foundation. This is followed by a description of the methods generally used in practice. Simple analyses of structures, presented at the conclusion of each chapter, can be carried out by a pocket calculator. This book will prove useful to practicing civil and design engineers.